Here are some other fences to consider that can better withstand the gusting fall winds. Do you need a new fence? Maybe your old one was knocked down by the wind. Sometimes it’s not as simple as picking it up and putting it back in place. 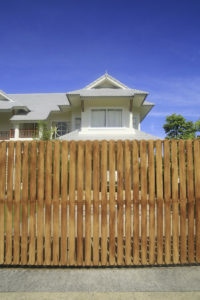 Here are some other fences to consider that can better withstand the gusting fall winds. The classic picket fence is an American icon. The slats on a picket fence are wide enough to let wind through, but the trade-off is they won’t provide as much privacy as you want. If that’s a concern, then you may want to choose a different fence instead. You can also choose to redesign the picket fence so that the slats are closed. This will increase your privacy, but can also lead to your fences being knocked over by the wind rushing past them. Wrought iron fences and iron fences, in general, are great fences for letting the wind through. The upside to these fences, especially when they are decorative or ornamental, is that they can improve your curb appeal. Start getting ready for Halloween now by thinking about how you can dress up your wrought iron fences! If you want your fences to survive the windy weather, then vinyl might be the answer. Vinyl fences are far more flexible than their wood counterparts. Plus, vinyl fences can’t warp, rot, or be eaten by pests like wood can. Of all the fences available, you might decide to go for simplicity. Chain link fences are incredibly simple and useful, and they will save you some money too. All you need to do is make sure that the chain link has a concrete base or another base that will support it so it doesn’t blow away. This means you will need to get more posts to hold up your chain link fences.